Beaches are beautiful getaways and perfect places to spend some time away from the mundanity of daily life and the noise, pollution, and crowds of the big cities. There are so many pretty beaches to be seen all around the world and so many fun activities to be enjoyed at these beaches, from sunbathing and swimming to water sports and beach games. When the waters are warm and the sun is shining, one of the most popular things to do at the beach is go snorkeling. Suitable for all ages and especially popular with wildlife enthusiasts, snorkeling is a super way to spend some time exploring the world beneath the waves. There are hundreds of fantastic snorkeling spots and diving beaches to be found around the world, with Hawaii being home to some of the very best. From Waikiki Beach on Oahu to Kaanapali Beach over on Maui, the Aloha State has a long list of unbeatable beaches for residents and travelers to enjoy. The second largest island of Hawaii, Maui is home to many beaches all around its extensive coastline, but if you're looking for snorkeling beaches in particular, some locations are much better-suited to this activity than others. A whole host of marine creatures and tropical underwater environments are just waiting to be discovered all around the coast of Maui, with snorkeling in Hawaii being one of the most popular activities to enjoy on this island’s beautiful beaches. Most of the best Maui snorkeling spots are found on the western side of the island, but there are one or two good spots to the south as well. Read on to learn all about them. 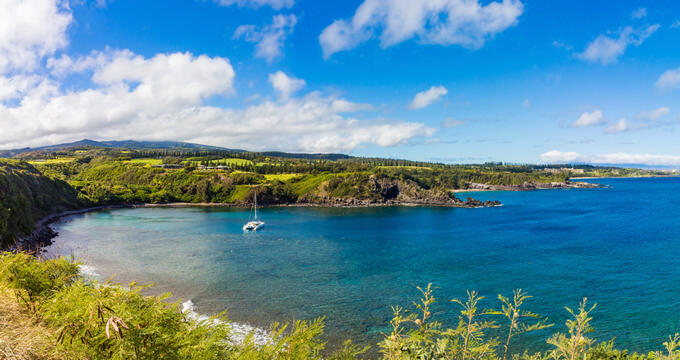 Right on the northwestern edge of the island, Honolua Bay is easily one of the best snorkeling beaches on Maui and highly convenient for people staying in a hotel or resort on the western side of the island. The best time to go snorkeling on this Maui beach, and many others, is early in the mornings as the intense sunlight and calm waters help to provide the clearest views. Honolulu Bay is actually part of a Marine Preserve area, with a large reef and lots of tropical fish found to the southern side of the bay in particular. Also known as Kamaole Park III, but referred to simply as Kama III by most locals and visitors, this tends to be the least crowded of the three Kama beach parks and is the best one for snorkeling. It's one of the only snorkeling spots on the southern shore of Maui and has a lot of useful facilities nearby like free parking, restrooms, grills, picnic areas, and more, so you can have a good snorkeling session and then head back ashore to rest and recuperate. Lifeguards are also on duty here, helping this to be one of Maui's safest snorkeling spots. Good snorkeling can be enjoyed all around this beach, especially to the right hand side. Some of the species you can expect to see here include parrot fish, pufferfish, and different types of tangs. Also known as Airport Beach due to the fact that the island's main airport used to be situated nearby, this western shore location is another of Maui's best snorkeling beaches. It's a cozy little spot to spend a full day out on the sand and in the water, and the local reef is simply filled with fish and other forms of marine life to be observed and admired. If you want to spend some time on this beach when you're done snorkeling, you may want to bring an umbrella or beach tent along as there aren't too many shady spots. You may also know this beach under the name of Mokule'ia. It's actually one of western Maui's hidden spots, without any shuttles or buses running to the area, but is still relatively easy to access by car and is quite a nice beach to visit for activities other than snorkeling like swimming and beach games, especially in the summer months when the waters are calm. Depending on when you visit, the waves can either be gentle or quite rough here, so it's important to pay attention to the conditions around you and stay safe. Lots of green sea turtles are spotted under the waves here, along with many species of colorful fish and even eels. Another snorkeling spot on the southern side of Maui, Makena Landing Beach is designed with more experienced snorkeling enthusiasts in mind as the terrain can be quite rocky and difficult to navigate in places. There's actually an underwater cave here, which can be a lot of fun to explore, but getting into it requires some skill. If you do have the experience and fitness levels needed to enjoy this snorkeling spot, you'll find it to be one of the best on the island, with a seemingly endless list of species swimming about beneath the surface. This is also the best snorkeling spot on Maui when whale season comes along as lots of humpback whales can be heard in the area.